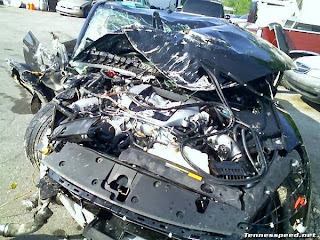 ...owner of the totaled GTR from 9/6/08. It is totaled. I understand the speculation that has come about from this accident and yes it was my GTR. I suffered minor injuries, while my best friend who I have known for 17yrs was the passenger and suffered a broken left leg and broken right ankle. I wish every day since that the injuries were vice versa. He is on the road to recovery and is doing much better since, and its quite possible he may be able to use crutches in a couple of weeks. I was not even close to 100mph. No one and I seriously mean no one survives a 100+mph crash hitting a rock wall. I have detailed pictures of the totaled vehicle including a pic of the speedometer which is frozen just under 60mph. 60 mph when it hit at least. wow i'm glad you guys are alive from this. May God's console reach upon you Himself. Hope you are fine, and will be fine and well in the future as well. Maybe if there's anyone who reads this blog regularly (like I do), will remind yourself and not to be too aggressive in driving. I had some bad experience in driving as well, and the car was quite badly damaged too... I thank God for that I learnt a lesson and noone was injured..
probably this could be a good reminder for those regular readers. I myself had some very bad experience in accidents too. I always thought I was one of the best driver but sometimes, things are just out of our control. Hope God's consolation will reach upon you to heal everything that'd been broken. Not my car. Just posting up a quote from the thread. It was a pretty big hit. Dylan, Again not my car, but someone did it. Not the first person or the last person to crash a car. There have already been more than 1000 cars sold in the US. The first year they are expecting to sell 2400 cars. The R35 GT-R does well in crash tests. Dylan if you look carefully, it doesn't say anything about kids driving the the GTR. But coming from a racing background its amazing how many times racers and people slip and slide do to the horse power of there car. I think anyone can have what ever they wont as long as they know there consequences. Also there are a good handful of kids that know how to drive very well.